Dynamos generate pulsing direct current through the use of a commutator. The rotating part of an electrical machine. 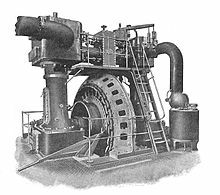 The stationary part of an electrical machine, which surrounds the rotor. The magnetic field producing component of an electrical machine. The magnetic field of the dynamo or alternator can be provided by either wire windings called field coils or permanent magnets. 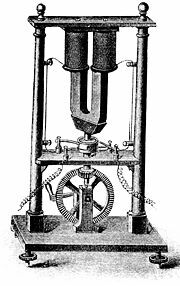 Electrically-excited generators include an excitation system to produce the field flux. A generator using permanent magnets (PMs) is sometimes called a magneto, or permanent magnet synchronous generators (PMSMs). The power-producing component of an electrical machine. In a generator, alternator, or dynamo, the armature windings generate the electric current, which provides power to an external circuit. The armature can be on either the rotor or the stator, depending on the design, with the field coil or magnet on the other part. 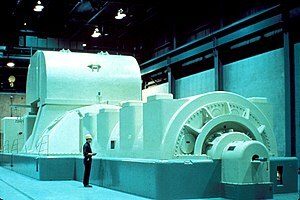 New generator designs such as the asynchronous or induction singly-fed generator, the doubly-fed generator, or the brushless wound-rotor doubly-fed generator are seeing success in variable speed constant frequency applications, such as wind turbines or other renewable energy technologies. These systems thus offer cost, reliability and efficiency benefits in certain use cases. parameters can be determined by measuring the winding resistance (corrected to operating temperature), and measuring the open-circuit and loaded voltage for a defined current load. 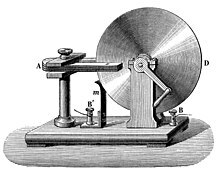 ^ Also called electric generator, electrical generator, and electromagnetic generator. ^ Augustus Heller (April 2, 1896). "Anianus Jedlik". Nature. Norman Lockyer. 53 (1379): 516. Bibcode:1896Natur..53..516H. doi:10.1038/053516a0. ^ Thomas, John Meurig (1991). Michael Faraday and the Royal Institution: The Genius of Man and Place. Bristol: Hilger. p. 51. ISBN 978-0750301459. ^ Basler, Michael J.; Schaefer, Richard C. (2008). "Understanding Power-System Stability". IEEE Transactions on Industry Applications. 44 (2): 463–474. doi:10.1109/tia.2008.916726. ISSN 0093-9994. ^ "Hurricane Preparedness: Protection Provided by Power Generators | Power On with Mark Lum". Wpowerproducts.com. 10 May 2011. Retrieved 2012-08-24. ^ "Program: hpv (updated 6/22/11)". Ohio.edu. Retrieved 2012-08-24. 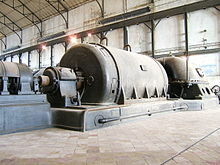 ^ Geoff Klempner, Isidor Kerszenbaum, "1.7.4 Equivalent circuit", Handbook of Large Turbo-Generator Operation and Maintenance, John Wiley & Sons, 2011 (Kindle edition) ISBN 1118210409. ^ Yoshihide Hase, "10: Theory of generators", Handbook of Power System Engineering, John Wiley & Sons, 2007 ISBN 0470033665.